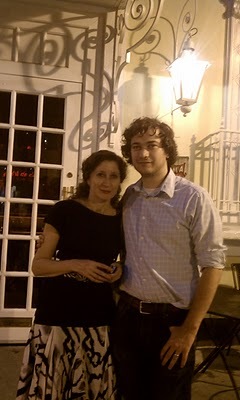 Two Fridays ago, Mr. B and I took his mom out for her birthday, to Alma de Cuba in Center City Philly around 7:30 pm. The goal was for her to relax and enjoy. We had an excellent dinner, followed by frozen yogurt down the street. A mojito and two cocktails later between the three of us, we were pretty relaxed. By the time we were leaving to head back to our car, parked in a garage at Liberty Shops, it was really dark out, maybe 9:30 or so. While there were definitely some people walking around, it wasn’t too crowded. As we turned onto 16th Street from Walnut Street, all of a sudden, a group what I thought to be maybe 30 or 40 pre-teen and teenage kids, mostly black, although maybe some others as well, rounded the corner and moved at us. and not just in Philadelphia, although Philly is quickly becoming known as the flash mob capital. I panicked. I had my cell phone in my hand. Could they steal it? It was just three of us, and the group of kids went around us like a school of fish. I tried not to make eye contact with any of them. I hoped Mr. B’s mom didn’t know about the flash mobs so she wouldn’t become nervous. The group moved through us like a swarm of fish and were behind us a second later. The thought of self-defense obviously came to mind, but if they had decided to do something, we all would have been done. The only thing we could have possibly tried to do was to run. There was no sign of police anywhere, and no sign of the group breaking up. They thankfully didn’t do anything, but they were talking loudly and aggressively, and further down the street, 5 or 10 more kids passed us, glomming on to the group. As we walked into the garage, I made eye contact with Mr. B as we both realized how serious the situation could have gotten. And, actually, later on in the evening, it did. As a poster says later down in the thread of Philadelphia speaks, the mob activated and assaulted someone near Butcher and Singer, very close to where we were. As a result of the incident, I no longer feel safe in Philadelphia after dark, even Center City, which is supposed to be a relatively safe area. I’ve never felt this way in DC. I don’t trust the police to break things up, which isn’t surprising, given that they didn’t break up previous flash mobs in time, either. The fact that the police had allowed such a large group to form and wander around without doing anything about it, especially given recent news, really pissed me off. The reason I’m writing this is that I remembered the incident in wake of the news that Philadelphia mayor Michael Nutter is posed to address it. He already said something this weekend at his church, but honestly, the people that attend church are the people who already know the message. So I’m staying tuned to see what happens, but my pessimistic Russian guess is, nothing that will result in a positive change. Leave your solutions for race-socio-economic iniquity, funding a city’s police force to be more effective and engendering the trust of its citizens, and, most importantly, making parents parent their kids, in the comments.